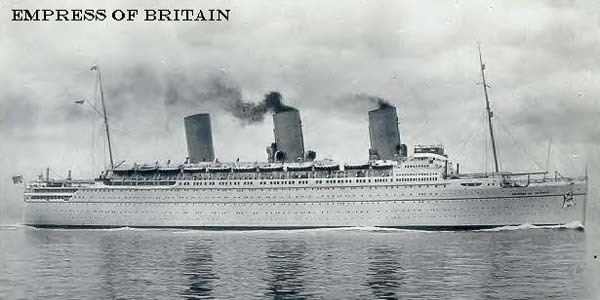 Empress of Britain was the largest and fastest liner built for the Canadian Pacific Line at that time. Her maiden voyage from Southampton - Cherbourg and Quebec began May 27th 1931. With a crossing from Cherbourg - Farther Point in 4 days, 19 hours and 35 minutes, Empress of Britain set a new record on the Canada run. The decline in emigration trade to Canada at that time led to her being operated on one world cruise each year. After King GeorgeVI and Queen Elizabeth completed their good-will tour of North America in June of 1939, Empress of Britain was chartered for their return journey to Britain. Three months later, the outbreak of World War Two forced the British Admiralty to requisition Empress of Britain to serve as a troopship. Her first involvement in the war consisted of two trooping voyages from Halifax - Clyde/Scotland. In March 1940, Empress of Britain set out for Australia and New Zealand to join up with the other Allied liners Queen Mary, Aquitania, Mauretania and Andes in a convoy transporting troops to Europe. Empress of Britain embarked on her next trooping voyage from England - Suez via the Cape in October 1940. While nearing Ireland on her return journey, she was attacked by a long range German Focke-Wulf aircraft. The bombs that found their target caused so much damage Empress of Britain had to be taken in tow by the Polish destroyer Burza and two tugs. Two days later, October 28th, the German submarine U-32 tracked Empress of Britain down and fired two torpedoes into her hull. The extensive damage sustained in that attack forced the crew abandon ship. Empress of Britain went down soon after with the loss of around 50 of her crew between the two attacks.